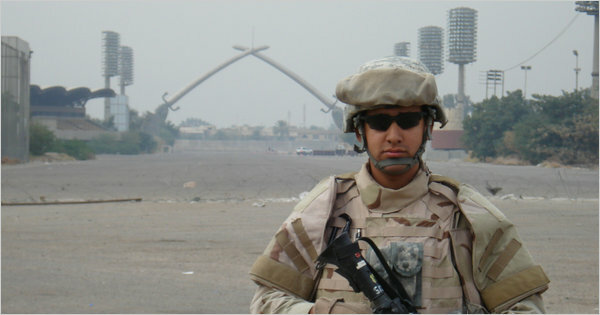 Published: Sunday, February 13, 2011 at 1:00 a.m.
Last Modified: Saturday, February 12, 2011 at 5:34 p.m.
U.S. Air Force Senior Airman Anthony Mena, here in Baghdad in 2007, had eight prescription medications in his blood when he died in July 2009. After a decade of treating thousands of wounded troops, the military's medical system is awash in prescription drugs. And the results have sometimes been deadly. By some estimates, well over 300,000 troops have returned from Iraq or Afghanistan with PTSD, depression, traumatic brain injury or some combination of those. The Pentagon has looked to pharmacology to treat those complex problems, following the lead of civilian medicine. As a result, psychiatric drugs have been used more widely across the military than in any previous wars. But those medications, along with narcotic painkillers, are being increasingly linked to a rising tide of other problems, among them drug dependency, suicide and fatal accidents -- sometimes from the interaction of the drugs themselves. An Army report on suicide released last year documented the problem, saying one-third of the force was on at least one prescription medication. "Prescription drug use is on the rise," the report said, noting that medications were involved in one-third of the record 162 suicides by active-duty soldiers in 2009. An additional 101 soldiers died accidentally from the toxic mixing of prescription drugs from 2006 to 2009. "I'm not a doctor, but there is something inside that tells me the fewer of these things we prescribe, the better off we'll be," General Peter W. Chiarelli, vice chief of staff of the Army, who has led efforts on suicide, said in an interview. The New York Times reviewed in detail the cases of service members who died from what coroners said were toxic interactions of prescription drugs. All were classified as accidents, not suicides. Given the complexity of drug interactions, it is hard to know precisely what killed the men, and the Pentagon declined to discuss their cases, citing confidentiality. But there were important similarities to their stories. All the men had been deployed multiple times and eventually received diagnoses of PTSD. All had five or more medications in their systems when they died, including opiate painkillers and mood-altering psychiatric drugs, but not alcohol. All had switched drugs repeatedly, hoping for better results that never arrived. All died in their sleep. The military medical system has struggled to meet the demand caused by two wars, and to this day it still reports shortages of therapists, psychologists and psychiatrists. But medications have always been readily available. Across all branches, spending on psychiatric drugs has more than doubled since 2001, to $280 million in 2010, according to numbers obtained from the Defense Logistics Agency by a Cornell University psychiatrist, Richard A. Friedman. Paradoxically, the military came under criticism a decade ago for not prescribing enough medications, particularly for pain. In its willingness to prescribe more readily, the Pentagon was trying to meet standards similar to civilian medicine, Chiarelli said. Thousands of troops struggle with insomnia, anxiety and chronic pain -- a combination that is particularly treacherous to treat with medications. Pairing a pain medication like oxycodone, a narcotic, with an anti-anxiety drug like Xanax, a so-called benzodiazepine, amplifies the tranquilizing effects of both, doctors say. Similarly, antidepressants like Prozac or Celexa block liver enzymes that help break down narcotics and anxiety drugs, extending their effects. In the case of Gunnery Sgt. Christopher Bachus, it is far from clear that he received the least amount of medication possible. He saw combat in Iraq, his brother, Jerry Bachus of Westerville, Ohio, said, and he struggled with alcoholism, anxiety, flashbacks, irritability and survivor's guilt after returning home. "He could make himself the life of the party," Jerry Bachus recalled. "But he came back a shell, like a ghost." Christopher Bachus received a diagnosis of PTSD, and starting in 2005, doctors put him on a regimen that included Celexa for depression, Klonopin for anxiety and Risperdal, an antipsychotic. In 2006, after a period of stability, a military doctor discontinued his medications. But six months later, Bachus asked to be put on them again. According to a detailed autopsy report, his depression and anxiety worsened in late 2006. Yet for unexplained reasons, he was allowed to deploy to Iraq for a second time in early 2007. But when his commanders discovered that he was on psychiatric medications, he was sent home after just a few months, records show. Frustrated and ashamed that he could not be in a front-line unit and unwilling to work behind a desk, he applied in late 2007 for a medical retirement, a lengthy and often stressful process that seemed to darken his mood. In early March 2008, a military doctor began giving him an opiate painkiller for his back. A few days later, Bachus, 38, called his wife, who was living in Ohio. He sounded delusional, she told investigators later, but not suicidal. "You know, babe, I am really tired, and I don't think I'll have any problems falling asleep tonight," he told her. He was found dead in his on-base quarters in North Carolina nearly three days later. According to the autopsy report, Bachus had in his system two antidepressants, the opiates oxymorphone and oxycodone, and Ativan for anxiety. The delirium he experienced in his final days was "most likely due to the interaction of his medications," the report said. Nearly 30 prescription pill bottles were found at the scene, most of them recently prescribed, according to the report. Jerry Bachus pressed the Marine Corps and the Navy for more information about his brother's death, but received no further explanations. "There was nothing accidental about it," he said. "It was inevitable." The widespread availability of prescription medications is increasingly being linked by military officials to growing substance abuse, particularly with opiates. A Defense Department survey last year found that the illegal use of prescription drugs in the military had tripled from 2005 to 2008, with five times as many troops claiming to abuse prescription drugs than illegal ones like cocaine or marijuana. The problem has become particularly acute in specialized units for wounded troops, where commanders say the trading of prescription medications is rampant. A report released last month by the Army inspector general estimated that up to a third of all soldiers in these Warrior Transition Units are overmedicated, dependent on medications or have easy access to illegal drugs. Some of that abuse is for recreational purposes, military officials say. In response, the Army has taken several steps to tighten the monitoring of troops on multiple prescriptions in the transition units. But in many cases, wounded troops are acquiring drugs improperly because their own prescriptions seem ineffective, experts say. They are self-medicating, sometimes to death. "This is a huge issue, and partly it's due to the availability of prescription drugs among returning troops," said Martin P. Paulus, a psychiatrist at the University of California in San Diego and the VA San Diego Medical Center. "Everyone knows someone who'll say, 'Hey, this worked for me, give it a try.' "
After coming home, he spoke repeatedly of feeling guilty about missing patrols where a sergeant was killed and where several platoon mates were seriously wounded. Had he been driving on those missions, he told therapists, he would have avoided the attacks. He returned from his second deployment to Iraq complaining of back pain, insomnia, anxiety and nightmares. Doctors diagnosed PTSD and prescribed powerful cocktails of psychiatric drugs and narcotics. Yet his pain only deepened, as did his depression. "I have almost given up hope," he told a doctor in 2008, medical records show. "I should have died in Iraq." By the summer of 2008, he was on half a dozen medications for depression, anxiety, insomnia and pain. His back and neck pain worsened, but Air Force doctors could not pinpoint a cause. Once gregarious and carefree, Mena had become perpetually irritable. At times he seemed to have hallucinations, his mother and friends said, and was often full of rage while driving. In February 2009, he was honorably discharged and given a 100 percent disability rating by the Department of Veterans Affairs, meaning he was considered unable to work. Yet for all his troubles, he seemed hopeful when his mother, Pat Mena, visited him in July 2009. The night after his mother left, he put on a new Fentanyl patch, a powerful narcotic often used by cancer patients that he had started using just five weeks before. With his increasingly bad memory, he often forgot what pills he was taking, his mother said. That night, July 21, 2009, when he put on his new patch, he forgot to remove the old one. He died the next day. He was 23. A toxicologist found eight prescription drugs in his blood, including three antidepressants, a sedative, a sleeping pill and two potent painkillers. Was the Fentanyl the cause? Or was it the hydromorphone, another narcotic found in his system? Or the antidepressants? Or the sedative Xanax? Or all of the above? The medical examiner could not say for sure, noting simply that the drugs together had caused "respiratory depression."